Marlon Brando was an American actor. Marlon Brando was born in Omaha, Nebraska on April 3, 1924, to parents who were both alcoholic and promiscuous. 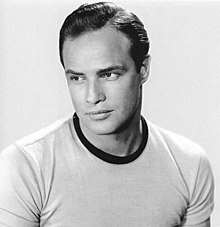 Marlon Brando popularized the jeans-and-T-shirt look, with and without leather jacket, as a movie idol during the early 1950s. In 1960 he married a Mexican actress, Maria "Movita" Castaneda, at least 16 years his senior, who had appeared in "the first Mutiny on the Bounty" in 1935. Marlon Brando is known for bringing "real" acting, on stage and screen, into main stream. His breakout role was on stage for "A Streetcar Named Desire. "Marlon Brando, considered by some to be the greatest actor of all time, died on July 1, 2004. Brando has the Moon and Sun in Aries, conjunct in the 4th house in the natal horoscope.The combination of Venus and Mercury made him a food- and pleasure-loving, overindulgent sensualist who often cast himself as the charming personality who knows all. Venus is a particularly appropriate planet for this extraordinarily talented actor. Besides housing the Sun and Moon, Brando's 4th house of roots and foundations has Pisces on the cusp, co-ruled by Neptune and Jupiter.